approach. Chase the Pain is a very simple process for applying EFT to pain and physical problems. It can also be used on emotional issues, as a gentle approach, one that can minimize the likelihood of emotions coming to the surface whilst you work to clear them. The following is the transcript from the interview I did with Beryl. The brief summary is that as a result of a car accident Beryl had severe pain issues down one leg. From a medical perspective there was nothing more that could be done for Beryl other than just get on with her life. Using the Chase the Pain approach after about fifteen minutes Beryl had dramatic results. Her range of movement had dramatically improved and so had the pain. Below is Beryl’s story in her own words. Tania: Alright, maybe you could tell us about the problem you are experiencing so that people can understand that. Beryl: Two years January 2010 I had an accident. I have quite a steep drive. My car was parked on the drive and I threw a brief case in and I always leave the car in gear, it must have knocked out of gear, and as I got inside the car, the car started to roll back. The jolt of the momentum thru me back onto my back and I’ve got a lot of problems with my left side since. One of the main problems was my lower back, coming right around into sort of my hip, and then going down to my knee. It’s been an ongoing problem, very painful and that’s when I saw you Tania. Tania: Alright, so if I get that right, The car rolled back it knocked you? Tania: And you hit the ground really hard? Tania: Alright, and what did you do after that because obviously you had quite a big problem there? Where you taken to the hospital? Beryl: I went to the hospital. I had chipped the vertebrate in my spine, a fractured sternum and ribs as well. But really my hip problem sort of, was something that was never, although I complained about it, it was something they said that it could be rheumatism which was caused through the accident later on, well that’s what was said to me later on. Tania: Alright. With that, I’m assuming you sought different therapies or different ways of working with this. What did you use? Beryl: I went to see an osteopathy. I went to a chiropractor as well as having massage, reiki, reflexology. You name it I tried it. Tania: And you also did the medical route as well? Beryl: I did do the medical route. I was on pain killers. The pain killers were only sort of taking the edge off it; it didn’t suppress the problem it was still there. It probably wasn’t quite as bad but certainly didn’t take it away. Tania: So what level of pain killers were you on to deal with this problem? Beryl: Well I was on__________ I was on 8 pills a day. Then they took me off those and put me on ibuprofen and that was 400 mg and I was on that 3 times a day. But like I said, it was always there, it just sort of took the edge off it. Tania: So what did it stop you doing, that problem? Beryl: Oh, while walking I was in excruciating pain. Really, generally some mornings I would get up and it was like oh my gosh, putting my foot onto the floor was absolutely painful. I think sort of sometimes I lay different in bed and that would sort of aggravate it more. But I could never really tell you what it was that made it worse. Tania: But just some sort of ongoing pain? Tania: Now you came to my training session for EFT and I’m guessing by this point you’ve exhausted everything you thought you could do? Beryl: I was told it was something I would have to live with. Tania: Who told you that? Beryl: The doctor really, two different doctors. Tania: Alright. 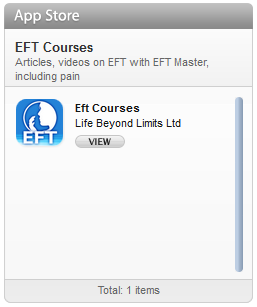 Now I did a demonstration on EFT on a particular approach called â€œChase the Painâ€ and you volunteered for me. Beryl: Yes, I thought I’ve got nothing to lose I ‘m going to try this. Tania: And you came down, you sat with me at the very front, in front of our audience of trainees, and we thought you could kind of test the limitations of the movement you could do. What was your experience of that? Beryl: Well it was very, very painful what I was trying to do and I couldn’t move my left I was sunk down on the chair and I couldn’t move my left knee up anywhere near as high as I could my right knee and when I tried to move the left knee it was very painful. Tania: I think at some point I said, just take it to the edge of that pain? Tania: Did you push it a little bit there? Beryl: I did, yes I really pushed it and it was very painful. Beryl: The very first thought, Am I imagining this! That was my first thought, Am I imagining this or does it seem to have moved? Tania: The pain sensations were moving around at the very beginning? Tania: Then I think they come to a very interesting point where by it wasn’t so much pain you were experiencing, it was something else. What was it? Beryl: Yes, it was more like an ache and it was going from my back, to the center of my buttock, and then it started going around into my groin. Tania: Alright. And then we kind of tapped through that using the kind of words you were coming up with. Beryl: The pain was different. Tania: Yes, that’s the Chase the Pain approach, very interesting approach. I think we got to a point where by it was a kind of a difference between that particular part of your body and the part of your body that didn’t have that problem. Tania: Can you remember back to that? How you thought about that? Beryl: As I described the pain originally, this stabbing pain, as an excruciating stabbing pain. And then it’s sort of more like a dull ache. That was felt up in my groin I could feel this ache, not like the pain I felt a different sensation more of an ache, a deep ache. Tania: I think it got down to the further we went to it, it got down to a tightness. Tania: I think maybe it was at that point that you began, actually began to be able to move the leg higher. Beryl: Because you asked me then, you said, Would you like to just try? and I was amazed I could actually just sit there and virtually pick my foot off the ground and move my knee which I couldn’t do before. Tania: I know, you stood up didn’t you? I thought actually you were able to move that side of your body higher than the other. Beryl: Absolutely. Absolutely. I was amazed when I stood up because I couldn’t of climbed over a small wall, if it had been a small wall about two foot I couldn’t of actually lifted my foot that high to have gone over it. I was lifting my left knee higher than my right knee. Tania: You were looking pretty fit. Beryl: I was amazed. Tania: I could see that look on your face because you didn’t have that expectation. Tania: I think when I asked you to do that when you stood up you might have been a while later. Beryl: Yes, it was a little while later and I think you’re absolutely right it was, it was absolute shock because I’ve been to so many different people as I’ve said to you before and not having any results. I have a little bit of sort of feeling a little bit easier but certainly nothing like with the EFT. Tania: For one thing if you think of the problem as zero point and ten is 100% perfection back to where you should to be with the treatments before EFT what percentage improvement have you made? Beryl: Starting with the EFT to this point today? Tania: No before the EFT. 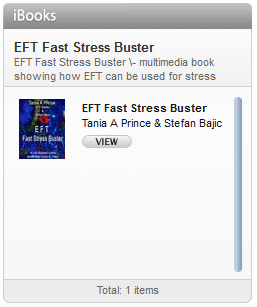 Tania: Before using the EFT and 100 would be total improvement let’s use that scale. Beryl: _________surgery about 95% improvements on it. 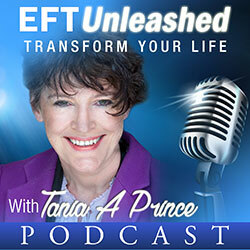 Tania: Previous to EFT, how much improvement had you made? Tania: Alright, it was getting worse. Beryl: It was getting worse, yes. I think that was the frightening part for me, because it was actually getting worse. Tania: Alright. I think people have to realize that if you’ve got a limitation in one part of your body, the other parts of your body have to compensate. Beryl: Absolutely. I was getting pains in my right knee and I think that was obviously the way I was walking. Tania: It creates a big imbalance in the body. Other parts of the body take the stress. Tania: So you say 95% improvement. Tania: Now I was doing a demonstration really to teach therapists, during this, so we don’t necessarily have the kind of time that we would have if someone came to our clinic but if we give the time roughly that we did in that demonstration, how long would you say that was? Beryl: I would say 10 or 15 minutes at the most. Tania: It wasn’t very long? Tania: And I think that’s what very important to say here is we didn’t actually spend that long working with this. I know you’ve done a piece of tapping outside because you realize it can improve it? Tania: But basically you have from a 10 to 15 minute session and a little bit of tapping outside of that you’ve got a 95% improvement. Beryl: Which I.m delighted with. I never thought I would have that sort of movement again. Tania: You know a thought comes to mind, we all watch these movies, don’t we? And don’t we love it when a miracle happens? Beryl: We do, yes. Absolutely. Tania: When you just said that, that’s the thought that comes to mind. We never kinda expect it to be us. Beryl: No, no we don’t. And ___ when I stood up. __________actually do that. Oh my, I can actually do this. Tania: I know, I’ve got your face in my mind___seeing____my mind. We don’t expect we will get this thing happen to us, but you know, I just want to point out to people with EFT we get some really excellent results with things people have said nothing can be done with. Beryl: I’m absolutely amazed. It was a miracle there’s no doubt about it. Tania: Alright. Are you on any medication now? Beryl: No. The only medication that I am actually on now is because I have a thyroid problem. Tania: Alright. Beryl: It has nothing to do with my hip. I have been taking it for about 15 year but that’s the only medication I take. Tania: Alright. I think if we roughly given a count of how long ago the training was? How many weeks ago was it? Beryl: It was the end of July. The last days in July, the 29th, 30th & 31st of July. Tania: Alright. We are now kind of the middle of August? Beryl: August, yes. Actually two and a half weeks ago isn’t it. Tania: Alright. That progress that we made in that session I’m thinking has either stayed constant or has it improved? Beryl: It certainly not gotten any worse. It could of slightly, because of the improvement, that’s how hard it’s like when I think of things connected with that accident____on it. Tania: Brilliant. Yeah, and I think what people have to realize the mind and body system gives us kind of little clues sometime. Beryl: It does. And as I said before, I think it was when the training was on when I was lying on the floor I could actually see the wheels coming and I thought, Oh my God this is my end, it’s going to come right over me. I lost sense of where I was and where the car was not____these wheels. I _____. Tania: Brilliant because that actually quite a big trauma, very big trauma, in that moment you see what happened is you don’t know if you’re going to survive. Beryl: No, no I didn’t at that moment. Tania: Just because we do survive and just because time goes by on doesn’t mean to say we let go of that trauma. Tania: It stays with us and its like activated within our mind body system. Tania: And EFT is a very powerful technique for dealing with the trauma we’ve experienced, even in our past. Beryl: Well, that’s what’s been coming up while I’ve been tapping so that’s why I need to tap on it. Beryl: And now it’s something____I think I’ve cleared that initial trauma. Tania: Well, the thing is you kinda have an indication when you’ve cleared something and if you got a trauma and you remember it clearly. Tania: That’s an indicator it’s still affecting you. We don’t tend to remember things that are of no importance to us. Tania: Now if the memory pops up periodically you may not get into the emotion of it but if it’s popping up periodically that’s also an indicator that’s it’s there affecting you, yes? Tania: Alright. So what you’re saying to me here now, its stopped popping up? Beryl: That’s right. I would say to you over these probably past 5 or 6 days it has stopped popping up and like I say after I left you _____________flashback of that experience. I said, I need to tap on this.â€ And now I can truthfully say I’m not having that, I mean I know what happened but I’m not reliving it. Tania: Yes, If I just point that out to you, people who are listening in on this call, you said, I know what happened€. Tania: I’s like when you now think about it, my guess it truly is in the past. Beryl: Absolutely. I’m not reliving it, because before I was reliving it. Tania: If anyone is listening to this your words reliving it, it’s almost like you’re looking as if it happened right now. Tania: And when we actually tap what we find is, you find you’re no longer looking from that perspective you can see it like an observer. Beryl: Absolutely. Well, this is it, I’m not involved. Before I was involved and emotions where, “Oh, my God this is it”. Yeah, but now I don’t. Tania: And it’s good to have that power within your fingertips, isn’t it? Beryl: Yeah, absolutely. Oh yeah I use it, what should I say, every morning I use it, sometimes at night but every morning I tap. Tania: Brilliant. Well, I’m going to finish the call in a moment’s time but what would you say to anyone listening living with a physical problem? What would be your advice or tips to them? Beryl: Try EFT. Go on try it, you may have a miracle like I did and good luck to you. Beryl it”s been a pleasure talking with you. Beryl: Thank you very much for all your help. Tania: Thank you that was great fun. This article was written with the help of Beryl who kindly took the time out to be interviewed by me.